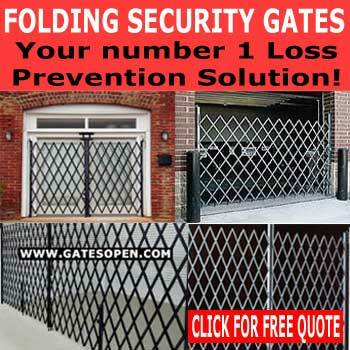 Security folding gates are the low cost way to protect against pilferage and unauthorized entry. Our gates are constructed of galvanized steel web that make it almost impossible for a smash and rob criminals. Visionmaster’s non-interference web design preserves the integrity and durability which make our gates almost impenetrable to crooks . Our security folding gates are put together with aircraft grade aluminum rivets that are rust resistance and help prevent corrosion. Our security folding gates come complete with smooth rolling wheels and padlock enabled. All of our double door gates have a cane bolt that holds the left-hand gate in place. Both gate halves can be opened and folded out of the way allowing full door access. If you have a point of entry or an exit to a region or location that receives a high amount of traffic, but still requires a moderately high level of security, it could be to your advantage to think about installing a security folding gate. Overhead doors used in warehouses and factories may be suitable, but they may not secure your business enough to keep unauthorized people out. In addition to being effortlessly compressed or extended, a security gate, such as our, made in America, folding gates can be rotated 180 degrees, to permit simple access to larger vehicles. In addition to being secure, scissor style security gate can add flexibility and they can be custom made to suit your specifications. Because they come in different forms, security gates can also be utilized in diverse ways. All of the design and assembly of our scissor gates are manufactured with galvanized steel, which is more resistant to rust and corrosion. If you can not find what you’re looking for feel free call one of our knowledgeable security gate experts for a FREE QUOTE on a custom made gate to fit your specifications.